On Fedora Core 5, the ALSA libraries and corresponding utilities come pre-installed and configured out of the box. Other distributions may or may not have this feature, but this simplifies the setup. The MythTV WIKI has a good How-To for configuring Digital Sound and provides a good starting point for configuring it on Fedora Core 5. However, due to the pre-installation nature of Fedora Core 5 and the ALSA suite, a fair chunk of the WIKI document does not apply and a lot of the information gets lost in the mix. You need to have S/PDIF available on your motherboard. You need to have an S/PDIF adapter that brings some form of digital port to the exterior of the machine (optical audio, coaxial audio). One such adapter is from Vidabox. Check the Sound Card entry in this WIKI. The Digital Sound entry in this Wiki is very complete. However, from my experience, it was a lot more than I needed. As such, some of the important information got lost. By default, with Fedora Core 5, all of the correct entries are automatically put together for you. Hence, there is no need for a local .asoundrc or /etc/asound.conf in order to send digital audio out via the SPDIF adapter. All you need to reference ALSA:spdif when performing your tests. But this is not the end solution, so please, read onwards. This is, actually, a good sign. Testing with "mplayer" (see the "Testing" section near the end of this document) should output digital AC3 sound which will tell you that the device is working. You can also test with a MP3 file and get audio (maybe..), but it will be slightly faster due to the difference between the MP3's 44.1khz and the expected digital audio at 48khz. Don't worry.. this will get resolved. This part is the easy part. Fire up mythfrontend and navigate to: Utilities/Setup->Setup->General On Page 3, change the default audio device to "ALSA:default" and change the passthrough device to "ALSA:default". Finally, check the box next to "AC3 to SPDIF passthrough". 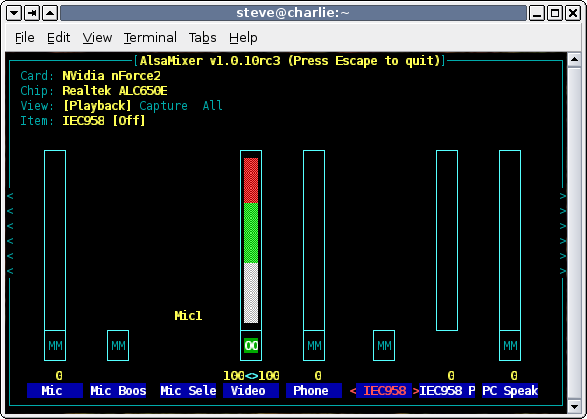 I was unable to get the ALSA utility "speaker-test -c6" to work over the digital audio output.